The chapel was thick with the presence of the Holy Spirit last night. It is clear that God is up to something in our community as we enter into the work of being peacemakers, people of Shalom, in our broken world. The focus of our opening liturgy was seeking God’s kingdom and righteousness. I couldn’t help but think back to Meredith’s teaching that biblical righteousness is relational while Sam was leading us in a new chorus, “We seek your kingdom, seek your righteousness.” This chorus was woven into our reading of Matthew 6. Rabbi Moffic then helped us to better understand what Jesus meant when he said, “Blessed are the peacemakers” by teaching us about Shalom. Shalom is the word Jesus used when speaking about peace. Rabbi taught that Shalom is much more than a lack of fighting. It means wholeness, integrity, and right relationship. When we have Shalom in our relationships, we are not only free from conflict but we understand the other’s point of view. Then we heard three stories from our community. Lynne spoke about the difference between being an angry activist and being a peacemaker. Aaron shared a story of leaning into a relationship with our neighbors from the Al-Azhar Islamic Foundation. And Claudia spoke about her family’s commitment to literally live in the midst of poverty. 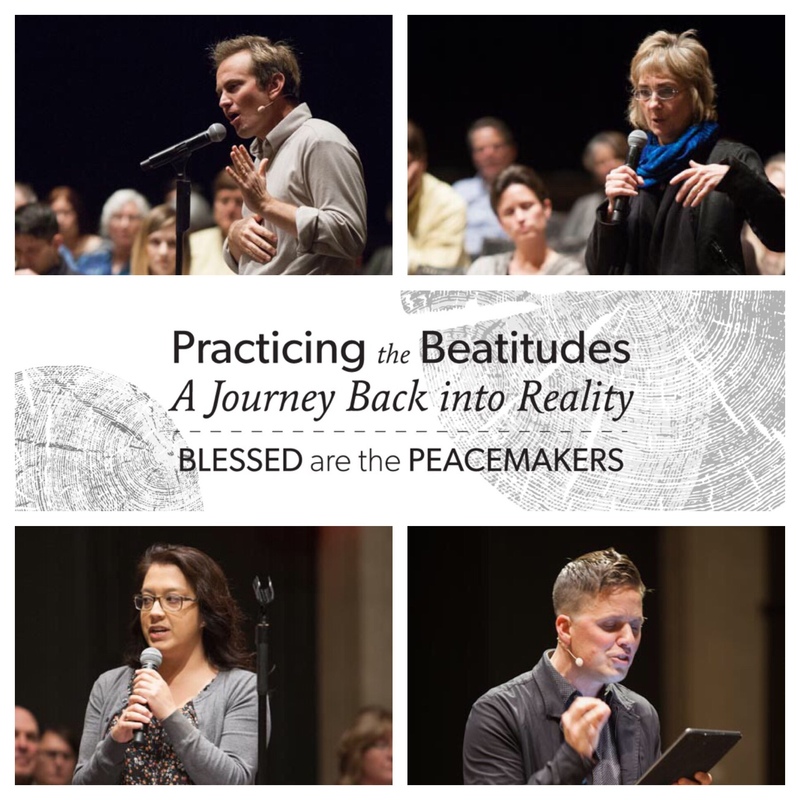 All three stories demonstrated a tension between retreating from a lack of peace and engaging as genuine peacemakers. As a community committed to putting the words of Jesus into practice, we cannot retreat. When faced with a lack of Shalom, we will not be peacemakers if we withdraw to a protective bubble, so our three kingdom practices this week are ways of leaning into peacemaking. Prayer journal – This week continue to pray the prayer of St. Francis, and journal your prayers, asking the Holy Spirit to lead you in being an instrument of Shalom. Be consistent in this prayer and pay attention to how your prayers might change as you engage the next two practices. Diversify your news sources and social media feeds – Too many of us live in an echo chamber. We only read things with which we know we will agree. We watch news outlets that align with our leanings. Our social media feeds are full of people who look and think the same. This week be intentional about diversifying your inputs. This is not an opportunity to hone your arguments or find more things that are wrong with the “other.” Listen. Recognize the dignity and image of God in them, and listen. Take the “other” out to coffee – Rabbi spoke about the intimate connection of internal and external Shalom. The second practice is primarily focused on internal Shalom with our neighbors, but this one is a tangible step of being a peacemaker in an actual relationship. Spend some time with someone you consider the “other.” Ask questions and listen. Hear their story. Begin to understand their heart.